So, I'm all about scratch cooking, right? Except when I'm not. I had a cake concept in my head and the important part wasn't the cake itself. I decided to use a box mix because it was easy. And, seriously, cakes at high altitude can be annoying. I didn't want the concept to fail because a cake recipe didn't adapt well to high altitude. 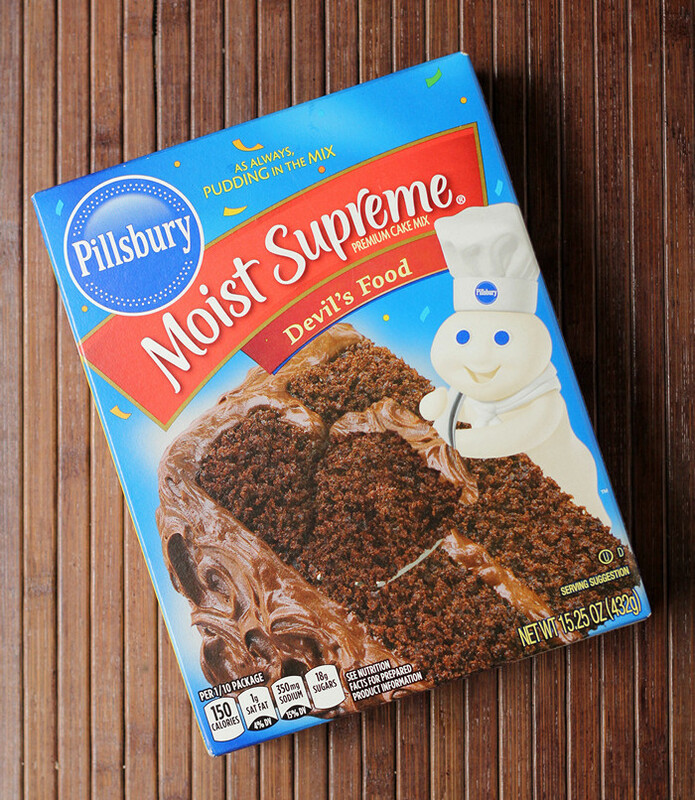 So I picked up a box of Pillsbury Moist Supreme Devil's Food cake mix. I hadn't used a cake mix in quite some time, so it was a somewhat random choice. Well, except that the Pillsbury Doughboy was very prominent on the front of the box. He's one of my favorite product spokes-animations. Right up there with the Geiko Gecko. But I digress. I bought the cake mix and on a cool(ish) evening decided to embark on my cake mix project. The first thing I did was check the box for high altitude instructions. I looked on the front, back, sides, top and bottom. I looked on the inside flap. And then I looked again. No high altitude adjustments. Dangit. Other box mixes I used in the past had some sort of adjustments, like adding a tablespoon of flour and maybe more or less water. Sometimes a different baking temperature or time. Ugh. But, rather than make a wrong adjustment, I made the recipe as it was printed on the box, and hoped for the best. Much to my surprise, it was done exactly on time, and it was freaking perfect. A nice bounce, a firm cake, and it didn't over-rise and collapse, which is the second-worst thing a cake could do. Worst is when it overflows the pan. I was in shock, I tell you. Shock. I still plan on making from-scratch cakes, particularly when I'm yearning for something new and different. But I might have to re-think my insistence on from-scratch every time. How about you? Are there cake mixes you like? Or do bake from scratch every single time? This is not a sponsored post, and I didn't get anything to sample. I bought the cake mix. When I was a kid, our telephone handset (back in the days when the phone had a cord attaching it to the rotary dialer part) had a bunch of divots on the back side. Why? Because my mother was prone to using it as a hammer. Much of our flatware was dinged and bent and off-kilter, because mom often used knives, spoons, and fork to pry things open or to unscrew screws. She was the queen of using everyday objects in ways they weren't supposed to be used. And from her, I learned how to open the front door of our apartment with a butter knife, because mom's relationship with her keys was on-again, off-again. On the other hand, my dad's mantra was that you should always use exactly the right tool for the job. It wasn't good enough to use a screwdriver. You had to use the correct screwdriver. It's amazing to me that those two people managed to like each other enough to get married and procreate. A constant wonder. While I appreciated mom's resourcefulness when faced with an emergency, I also embraced my dad's quest for the right tool for tasks that were likely to be repeated. Eventually, dad bought mom her own set of tools, but we still occasionally needed to borrow a butter knife from a neighbor to get into the apartment. It's my dad's influence that makes me love having this blog and reviewing so many different items. It's not really about which is the ultimate best, because I don't think that's possible. It's about having the best tool for the specific job. Swiss Army knives do a lot of different things are great for emergencies, but in the kitchen I prefer to have a paring knife and a chef's knife and a bread knife, each designed for specific purposes. In theory I could cut a slice from a bread loaf using a paring knife, but it wouldn't be pretty. So this brings us to the Rachael Ray 3/4 quart butter warmer pot. For those who are doing the math, that's 3 cups. Yes, it's a small pot. You're not going to make stock in it. But the pot is absolutely perfect for melting butter, as the name implies. Or for other small tasks where a larger vessel is just ridiculous, like heating that cup or two of milk for making hot chocolate. I've even used it for making a very small amount of caramel. Very small. Caramel can boil over easily. Or for heating a single serving of soup. Or warming some gravy or sauce. Or any other small cooking task. While I love my giant stock pots and even my normal-sized saucepans, they're simply not the right tool for the job when you're dealing with a small quantity. The interior of the pot is nonstick, so it's easy to clean. As far as the exterior, this pot, as well as a whole set of Rachael Ray Cucina cookware, comes in a number of fun colors. I chose the new lavender color, because I thought it was fun. Who's it for: Anyone who needs a small pot. Pros: Nonstick interior, pouring spout, attractive. Wishes: None really. I don't even want a lid for this type of pot. Ice pops and homemade popsicles seem to be pretty hot on blogs this summer. I've been thinking that maybe this is the year I'll buy some really cool molds, but I just haven't gotten to it. Maybe because there are no kids around here to eat them. But then again, I like a good ice pop once in a while. Or a boozy ice pop. And that's how I tested the Green Paxx ice pop molds - with boozy ice pops. The really big test was that I didn't have space in the freezer to stand the ice pops upright, so I had to lay them down in the freezer, and there was absolutely no leaking. Good thing, because I wasn't looking forward to cleaning the freezer. The molds are made from silicone, so they can be washed in the dishwasher, if you like, and the colors I got were pretty wacky. In a good way. Besides using them for ice pops, the company suggests using them for carrying snacks to school or work. Since they seal well, it makes sense, but since I work from home, I don't need to pack any snacks. They could also be useful for packing daily portion-controlled snacks to keep from over-snacking at home, I guess. The company also sent me some two-piece flexible silicone straws. I'm not entirely sure why a two-piece straw is better, except that you can take them apart for cleaning, or perhaps use the two parts separately. Since the straws are silicone, they're very durable and reusable. They'd be good for households with kids (of any age) who like to gnaw on their straws, since the kids wouldn't damage their teeth or the straw. But like any reusable straw, you need to clean them inside. If you clean them right after using, you can dip them in soapy water and rinse, but if you leave them sit too long or if bits of your smoothie got stuck in the straw, it's a good idea to give them a little scrub with a brush that's made to fit inside straws. The straws are a pretty large diameter, so they didn't fit into a few cups I tried that came with their own straws, but they did fit into the Ball Sip n Straw lids that I have, and the fit was snug enough that they would stay in place, and spillage would be minimal if the drink tipped over. 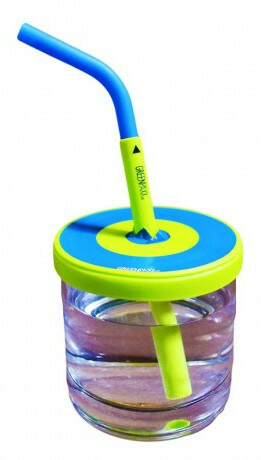 Green Paxx also makes a universal lid (which I didn't receive or test) that fits several sizes of drinking glasses that has a hole that will accommodate their straws. Who's it for: Mostly families with kids, but there are also non-kid uses. Pros: Silicone is pretty durable stuff. Fun colors. Cons: Still not entirely sure why a two-piece straw is necessary. I could imagine that kids of a certain age might have a lot of fun pulling them apart, though. Wishes: I like the idea of the ice pop molds for carrying snacks or other small items, but a non-tapered bottom would probably be more useful for that. 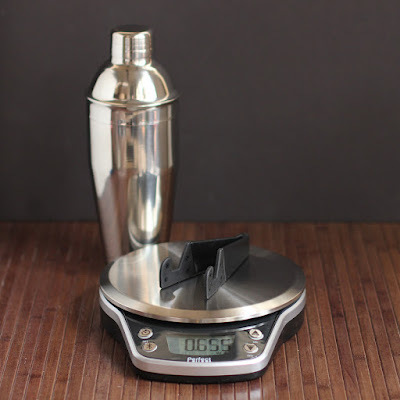 I could see using these to carry spices, nuts, bread crumbs, or other measured amounts of products to add as a finishing touch to foods taken to a potluck or party. I've been accumulating a little collection of silicone molds for candy, ice, and other moldable things, so I was more than happy to test trays that made building-brick shaped products and odd little people. Or maybe they're robots. I'm really not sure. 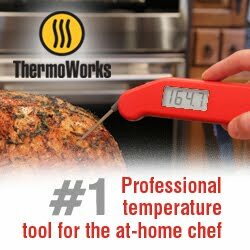 They've got all the usual properties of silicone - temperature range that makes them fine for freezer, oven, and dishwasher. They're pretty much nonstick. And they're flexible. I tried them with ice. I always need ice. And then I remembered that plain white ice doesn't photograph all that well, so I filled the trays with brewed coffee and used some milk to add some accents here and there. They worked just fine, except for a few where I poured too fast and ended up with bubbles in the pegs of the building blocks. But let's face it - they're just ice cubes. I wasn't planning on building anything with them. And now I know better. Folks with kids who like Legos will love these. I doubt kids will be all that impressed with coffee-flavored ice cubes, but of course you could use them for candy or for baking small treats. Who's it for: Whimsically-minded folks. Or people with kids. Cons: For some uses, it might be hard to get the product unmolded, because the "pegs" are small. It might take some practice to get it right. Wishes: Hmmm. None I can think of.